This page may contain affiliate links. Regardless, only products and services I trust are recommended. Please note the listings at the top of this list are primarily general transcription companies (although some of these do medical and/or legal, too). Scroll to the bottom for the medical transcription listings (for medical transcription, you typically do need to be certified and/or have experience). At the end of the page there are also listings for work from home captioners. An overview of general transcription jobs. An overview of medical transcription jobs. An overview of legal transcription jobs. This post explaining what equipment professional transcribers often use. And this reputable eCourse that teaches you exactly how to do general transcription (increasing your chances of getting hired by the companies below) and how to begin making money. The intro course is free! AccuTran Global – Read Review – Prefers experience but will hire newbies if skills test is passed. Appenscribe – Will hire newbies. Open worldwide. Company is based out of Australia. BAM! Transcription – This company will hire beginners if a skills test is passed. The app is not on their site, so you'll have to contact them via their contact form to get info on applying. Casting Words – Read Review – Beginners OK. You can work through Amazon Mturk or directly on their website. Only $1 is needed to request a payout. Crowdsurf – CrowdSurf offers transcription and captioning HITs on Amazon mTurk. You must have an mTurk account to work on their transcription/captioning tasks. Daily Transcription – Read Review – Specializes in entertainment, corporate, and legal transcription. GMR Transcription – Entry level OK. Hires from US and also Canada. Quicktate – Read Review – No experience needed. Must take a test before being hired. Hires in US & other countries. Rev – Read Review – Accepts beginners. Also offers freelance video captioning work. RNK Transcription – Entertainment/legal transcription experience a plus, but will consider people without it. Scribie – Read Review – No experience needed. Must take test. Hires worldwide. Waiting list and very low pay. Speech to Text Service – This company appears to be open to newbies. They pay weekly with Paypal and the rates are listed at $0.21 to $0.42 per audio minute. Tigerfish – Read Review – Entry level OK. Must take test. US only. T ‘n T Transcriptions & Translations – Entry level OK. Must pass skills test first. TranscribeMe – Read Review – This is another company that's open to hiring beginners. Pays via Paypal, no exp. needed to get in. Transcribe Team – Newbies can apply. Pay is low at .45 to .65 per minute of audio transcribed. Payouts are weekly via Paypal. Ubiqus – Read Review – Hires for all types of transcription. Will consider beginners. Must type at least 70 wpm. Verbal Ink – Read Review – Occasionally hiring for general transcription. They hire US-based transcribers only and do prefer experience, but you can still get in if you do well on their test. 3 Play Media – Read Review – Occasionally has openings for work from home transcript editor. This is not technically transcription, but rather editing transcription already done. A & P Transcription – Always looking for qualified transcriptionists to add to their team. Appears that they do prefer experience. AccuScribe Transcription – Hires experienced transcribers to work at home. Send resume and cover letter to apply. Alice Darling Secretarial Services – Must type at least 75 wpm. Not always hiring, check career page for openings. AlphaDog Transcription – They only hire experienced transcribers and they prefer if you've had experience in entertainment transcription. Additionally, you must reside in the Los Angeles area to qualify for work here although the position is home-based. Allegis Communications – Read Review – Hires occasionally for people to transcribe 20 hours per week. Pays twice a month with direct deposit. Must have at least two years of transcription experience. Babbletype – Read Review – Sometimes has openings for work from home transcribers and QA editors. Check their jobs page for current openings. Cambridge Transcription – Hires for legal and corporate transcription, experience required. Caset Associates – Hires worldwide. You need to type at least 90 wpm. Cyber Dictate – Are currently looking for US based workers with experience in legal transcription. Dictate Express – Legal transcription. Requires a minimum of two years experience. eTranscription Solutions – Typing speed of no less than 80 wpm required. Experience needed, details on career page. eScribers – This is a company that is frequently looking for remote legal transcribers. Experience needed. Weekly pay. Expedict – Hires only experienced audio transcriptionists. They receive a lot of applications so it may take a while to hear back if you apply. eWord Solutions – Requires some experience. US candidates only. They send files five days per week. They don't have employment info on their website, so you would need to use their contact form to inquire about jobs. Fantastic Transcripts – Requires experience. Not currently hiring, but will keep your info on file. Focus Forward – Read Review – This company is often hiring (I see their ads on Craigslist a lot). Experience required, accepts both English and Spanish language transcriptionists. Hollywood Transcription – This company may require experience though it is not stated as a requirement on the website. You must type at least 65 wpm. Landmark Associates – Read Review – Must take test, and they prefer experience, although if you can pass their skills test you can possibly get in anyway. Modern Day Scribe – Must contact them via email to find out if they are hiring. US only. Net Transcripts – Read Review – Lots of law enforcement based work, must pass background check for this work. Also hires for financial transcription. On the Record Reporting and Transcription – Must live in Austin, TX area because you will be required to work in the office during training time. OutSec – A UK based company that hires worldwide. Need at least two years of typing experience to be considered. Multilingual Connections – This company hires for home-based transcription. Most likely you will need to be fluent in a language besides English to qualify for a job. Preferred Transcriptions – Does medical, legal, and general transcription. One year experience required for general. Production Transcripts – Must be experienced. Fill out online application. Hires sporadically. Same Day Transcriptions – Professional transcribers only. Some federal work. Say It Back – Entertainment transcription. Must have digital foot pedal and software. Speak Write – Read Review – Does both legal and general transcription. Work is on a contract basis and you must have experience. Take 1 – Entertainment transcription. Appears to be a UK based company. Prefers experience. TASK Transcription – General and legal transcription. Requires three years of experience. Transcribe.com – Read Review – General transcription, experience preferred. US only. They pay daily with Paypal. Terescription – Does entertainment, business, legal, and education transcription. Requires experience. Transcript Divas – Hires US based, native English speaking transcribers on occasion to work at home. Good rates. Transcription Experts – US only for remote work. Minimum 2 years experience. Transcription Outsourcing, LLC – Transcription Outsourcing, LLC is looking for committed and professional transcriptionists. Voxtab – Requires experience. Hires freelance transcribers in many different countries, including the US. We Scribe It – Must have at least six months experience in the last two years for general transcription. Word Wizards – This company hires US based transcribers for various types of transcription, including audio and video. Written Communications – Prefers at least three years experience. Hires in the US and Canada. Note that you will need training before you can land a job as a medical transcriber. CareerStep is one the more reputable online schools you can use for the training you need to get certified. They will even give you a voucher ($250) to get your certification from AHDI once you've completed the training. You can read our full review of CareerStep here. Absolute Transcription – US only. Must have 3 years experience & be able to pass test. Amphion Medical Solutions – At least two years' hospital inpatient experience transcribing the “Basic Four” or at least two years' clinic experience transcribing all specialties (>4 specialties) in addition to any formal training. Eight Crossings – Eight Crossings welcomes inquiries from Medical Transcriptionists with a minimum of two years experience transcribing multi-specialty medical reports. Graduates from approved transcription training programs may also be considered. GMR Transcription – This company does medical as well as other types of transcription. You can get in with no experience but you have to pass a test. Hiring from US & Canada only. 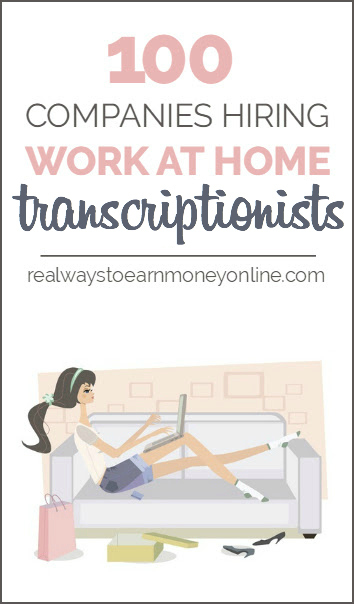 M Modal – Regularly hiring home-based medical transcribers. Must have either one year of past experience or be a recent graduate of an AHDI medical transcription program. NJPR – You must view their employment page for details about current open positions. Northeast Transcription – This company is accepting applications from new (within the past 6 months) graduates of formal medical transcription schools, with or without on-the-job experience. Penrad Imaging – Occasionally has medical transcription opening requiring 6-12 months prior experience. Colorado only, onsite training required. Perfect Transcription – They require at least 3 years experience in medical transcription and at least 2 years experience in a given specialty. Phoenix Medcom, Inc. – They require a minimum of 3 years experience for Acute Care work, and 2 years experience transcribing for a specialty practice, clinic, surgery center, etc. Production environment experience essential. Precision Transcription – Hires work from home medical transcribers to work as independent contractors. Must have at least 3 yrs experience in acute care. Precyse – Require 3 years experience. Full-time work available. Preferred Transcriptions – A minimum of two year's experience in a hospital or clinical setting, or with another medical transcription service. Same Day Transcriptions – They hire for medical, business, and general transcription. Fill out form online to apply. SoftScript – Must have three to five years medical transcription experience depending on the particular transcription job you choose (they have several choices). Attractive benefits package. Only hires people residing in the U.S.
SpectraMedi – Hires experienced medical transcribers to work at home. StenoMed – Looking for transcriptionists who have an in-depth understanding of medical terminology, anatomy, physiology, procedures, and treatment. StenTel – US only. Requires past experience or you must be graduated from an AHDI-approved program to apply for these openings. Superior Transcribing Service, LLC – They prefer someone who can give at least two years of experience transcribing multi-specialty medical reports or a graduate of a Medical Transcription Program. Terra Nova – A minimum of five years transcription experience covering many specialties is required. Ubiqus – Read Review – Hires for many different types of transcription, including medical. Required experience not listed. Verilogue – Hires for freelance medical transcription and translation. Requires experience and typically fluency in a foreign language. Word ZXpressed – Openings not always listed. You can check MTJobs.com for their listings when they are hiring. X-Press Transcription – US only. Requiring at least two years experience. AI Media – Read Review – This company hires freelancers to work on captioning movies, TV shows, YouTube videos, and more. Newbies welcome. However, pay rate is on the low side. Caption Max – Hires work from home captioners on occasion. You may possibly need to be located in or near Minneapolis, MN. Caption Media Group – Hires remote captioners with experience across the US. Contact them to find out if they are hiring. Rev Captions – This company regularly hires captioners to work from home. Vitac – Occasionally has openings for real time remote captioners. Experience is required. MT Jobs – The internet's largest source of medical transcription jobs and resumes. MT Stars – An old, established forum for medical transcriptionists. Transcription Essentials – Transcription Essentials is a community of transcription professionals who pride themselves on their commitment to excellence. AHDI – A listing of reputable schools to consider for medical transcription training.